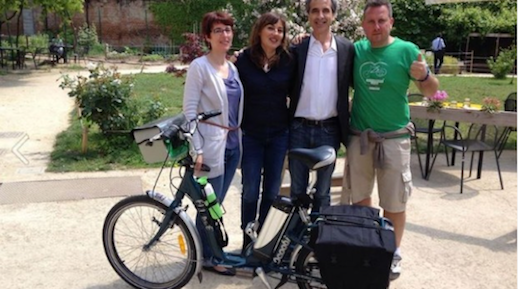 The Zero Waste activist Danilo Boni started cycling the tour which will bring him to visit many Zero Waste experiences in the country. The tour starts today Tuesday, May 27, in Milan in an event which acknowledge the efforts of 19 companies and start-ups who have distinguished themselves for promoting clean production processes in which all the outputs of the production are turned into inputs so that the materials remain in use. With this initiative, Zero Waste Italy in collaboration with the Municipality of Capannori (LU ), the Zero Waste Research Centre, the Association AmbienteFuturo and many local groups and municipalities throughout Italy, aim to highlight and reward the commitment of businesses in achieving the goal of Zero Waste . “More than 70 % of the waste problem can be solved by the citizens by separating waste for recycling. But the remaining 30% is waste which cannot be properly managed and needs to be redesigned upstream. This must be solved together with companies” said Rossano Ercolini, president of Zero Waste Europe. In the morning of May 27, councillor Piefrancesco Maran welcomed the delegation of the Zero Waste movement , including Paul Connett , a global promoter of Zero Waste strategy, Rossano Ercolini , winner of the Goldman Environmental Prize in 2013 and president of Zero Waste Europe and Enzo Favoino , a researcher at the Scuola Agraria del Parco di Monza and coordinator of the Scientific Committee of Zero Waste Europe. The meeting, sponsored by the City of Milan, highlights the success in the separate collection of organic waste in this municipality, which in June will cover 100% of the population and represents the most extensive and successful experience of separate collection of organic waste worldwide. In the afternoon the cyclist Danilo Boni, accompanied by a delegation of Zero Waste Italy, will start pedalling the electric bicycle Frisbee, provided by TC Mobility official sponsor of the tour. Later in the afternoon there was a meeting in Busto Arsizio, to be attended by Paul Connett and Enzo Favoino . After the meeting the tour continues along the way from the Villa Tovaglieri to the headquarters of the incinerator Accam. The event is organized by local committees Zero Waste under the patronage of the town of Busto Arsizio. Ercolini will also participate in a panel discussion open to citizens of the Versilia with mayors and councillors of Seravezza , Pietrasanta and Forte dei Marmi. The meeting, scheduled for May 29, is organized by GAS di Pietrasanta and Seravezza . You can follow the tour in the ZWTour blog using the hashtag #ZWtour and on the Facebook page of Zero Waste Italy.